HERACLES [her'a-klees], or HERAKLES (HERCULES), the most popular of Greek heroes, is associated especially with the area around Argos and with Thebes, where he was born. ELECTRYON [e-lek'tri-on] ELEKTRYON, son of Perseus and king of Mycenae, fought with Pterelaüs, king of the Teleboans. Electryon planned to attack the Teleboans, who had retreated to their land in western Greece, taking the cattle of Pterelaüs. Electryon also planned to leave his nephew, AMPHITRYON [am-fi'tri-on], as king in his place, and he betrothed his daughter, ALCMENA [alk-mee'na], or ALKMENE, to him. Amphitryon accidentally killed Electryon and left Mycenae to go into exile at Thebes, taking Alcmena with him. She would not lie with him until he had attacked the Teleboans and avenged her brothers, whom they had killed in the earlier war. Amphitryon returned victorious to find that Alcmena had already lain with Zeus in the same night. She bore twins, Heracles, son of Zeus, and IPHICLES [if'i-kleez], or IPHIKLES, son of Amphitryon. Hera, angry with Zeus, sent Eileithyia to delay the birth of Alcmena’s twins and hasten the birth of EURYSTHEUS [you-ris'the-us], child of Sthenelus, grandson of Zeus and king of Mycenae. The prophecy of Zeus, that the child of his blood to be born that day would rule over those that lived around him, was fulfilled by Eurystheus, for whom Heracles performed his labors. After the birth of Heracles, which took place when a servant of Alcmena tricked Eileithyia into relaxing her guard, Hera sent a pair of snakes to kill the twins. Heracles strangled them, and Tiresias, summoned by Amphitryon, foretold how Heracles would go on to perform great labors for humankind and finally join the gods on Olympus. Heracles was taught chariot driving, wrestling, archery, and music by various heroes. He killed LINUS [leye'nus], or LINOS, his music teacher, by striking him with his lyre. For this murder he was exiled to Mt. Cithaeron on the borders of Boeotia, where he saved the town of Thespiae from the ravages of a lion and freed the Thebans from paying tribute to the people of Orchomenus. Creon, king of Thebes, gave him his daughter, MEGARA [meg'a-ra], as wife. After Megara had borne several children to Heracles, he killed her and the children in a fit of madness caused by Hera. He inquired at Delphi how he might expiate his crime; the Pythia first called him Heracles (“Glory of Hera”) rather than by his usual name, ALCIDES [al-seye'deez], or ALKIDES, “Grandson of Alcaeus,” and told him to serve Eurystheus, king of Tiryns, for twelve years, performing the labors that he would impose. The Greek word for the “labors” is athloi, i.e., contests for a prize, which for Heracles was immortality. The first six of the labors were undertaken in the Peloponnese, and the other six elsewhere. Associated with them are incidental or subsequent exploits, known as parerga, “incidental deeds” (parergon in the singular). 1. The Nemean Lion. Heracles killed a lion at NEMEA [nem'e-a] by means of a club, skinning it by using the animal’s own claws. Henceforth he carried the club and wore the lionskin, his two most prominent attributes in art. 2. The Lernaean Hydra. A nine-headed serpent or HYDRA [heye'dra] lived in the marshes of LERNA [ler'na]. Each time Heracles clubbed a head, two more grew in its place, while Hera sent a crab to make things even more difficult. Helped by his nephew, IOLAÜS [i-o-lay'us] or IOLAOS, Heracles killed both monsters and dipped his arrows in the Hydra’s poison. The crab became the constellation Cancer. 3. The Cerynean Hind. A hind with golden horns, sacred to Artemis, lived on Mt. CERYNEA [se-ri-nee'a] or KERYNEIA. After pursuing the beast for a year, Heracles caught it, carried it back alive to Eurystheus, and then released it. Pindar says that Heracles went to the land of the Hyperboreans to find the animal. 4. The Erymanthian Boar. Heracles brought back to Eurystheus the monstrous boar that lived on Mt. ERYMANTHOS [er-i-man'thus], or ERYMANTHOS. 5. The Augean Stables. Heracles cleaned the stables of AUGEAS [aw-jee'as or aw'jee-as], son of Helius and king of Elis, who kept vast herds of cattle. Helped by Athena, he diverted the rivers Alpheus and Peneus so that they flowed through the stables. 6. The Stymphalian Birds. Heracles shot the birds that lived beside lake STYMPHALUS [stim'fal-us], or STYMPHALOS, in Arcadia. 7. The Cretan Bull. Heracles caught the bull that the Cretan king, MINOS [meye'nos], had failed to sacrifice to Poseidon. After bringing it back from Crete alive, he released it, and it came to Marathon, where Theseus caught it (see MLS, Chapter 23). 8. The Mares of Diomedes. The Thracian king DIOMEDES [deye-o-mee'deez], son of Ares, owned a herd of mares that ate human flesh. Heracles brought the horses back to Eurystheus, who released them and dedicated them to Hera. 9. The Girdle of Hippolyta. Heracles killed HIPPOLYTA [hip-pol'i-ta], queen of the Amazons, in battle and presented her girdle to Eurystheus. 10. The Cattle of Geryon. Heracles brought back the cattle of GERYON [jer'i-on or ger'i-on] from Erythia, a land far away in the west. He sailed there in a cup given him by Helius and killed Geryon (who had three bodies) and his herdsman, EURYTION [you-rit'i-on], and his hound (Orthrus) and drove the cattle back to Greece. 11. The Apples of the Hesperides. Heracles needed the help of Athena and Atlas to get the apples of the HESPERIDES [hes-per'i-deez], (“daughters of night”), which they guarded in a garden far to the west; around the apple tree was coiled the serpent LADON [lay'don]. The many-formed sea-god Nereus had to be held by Heracles before he would divulge the location of the garden. While Euripides says that Heracles killed Ladon and took the apples himself, usually he is said to have held up the heavens, with the aid of Athena, while the titan Atlas fetched the apples. After shifting the heavens back to the shoulders of Atlas, he brought the apples back to Eurystheus. Later Athena took them back to the garden of the Hesperides. 12. Cerberus. The final labor was to go to the Underworld and bring back the three-headed hound of Hades, CERBERUS [ser'ber-us], or KERBEROS. Heracles himself said (in the Odyssey) that this was the hardest labor. He brought Cerberus to Eurystheus and then returned him to Hades. The Centaurs. As a parergon to the fourth labor, Heracles was attacked by the centaurs while he was drinking wine with the centaur PHOLUS [foh'lus], or PHOLOS. He defeated them, but the immortal centaur, CHIRON [keye'ron], was wounded by one of the poisoned arrows and ended his suffering only by exchanging his immortality with Prometheus (see MLS, Chapter 4). Pholus died when he dropped one of the poisoned arrows on his hoof. The Olympic Games. After cleaning the Augean stables, Heracles, cheated of his promised reward (one tenth of the cattle) by Augeas, returned with an army and killed Augeas. After this victory he is said to have instituted the Olympic Games in the territory of Elis (they were actually founded several centuries after the supposed time of Heracles). Admetus and Alcestis. On his way to Thrace for his eighth labor, Heracles was entertained by ADMETUS [ad-mee'tus], or ADMETOS, king of Pherae, who was mourning the death of his wife, ALCESTIS [al-ses'tis], or ALKESTIS. Heracles wrestled with Death (Thanatos) and recovered Alcestis for her husband (see MLS, Chapter 11). b>Hesione. Coming back from his ninth labor, Heracles rescued HESIONE [hee-seye'o-nee] from the sea monster at Troy (see MLS, Chapter 19). When the king, LAOMEDON [lay-o'me-don], cheated him of his reward, he returned with an army, sacked Troy, and replaced Laomedon with PRIAM [preye'am], who had been called Podarces. Pillars of Heracles. As a monument of his journey to Geryon’s island, Heracles set up the Pillars of Heracles at the strait where the Mediterranean Sea meets the Atlantic ocean. Eryx. Crossing the strait to Sicily, he wrestled with ERYX [er'iks], king of the western tip of the island, and killed him. Echidna and Scythes. According to Herodotus, Geryon lived in the far north, where Heracles lay with ECHIDNA [e-kid'na] (“snake-woman”) who bore him SCYTHES [seye'theez], or SKYTHES, and two other sons. As a young man, Scythes, alone of the three, could string a bow left behind by Heracles, and he became king and ancestor of the Scythians. Busiris. Journeying to the garden of the Hesperides, Heracles killed the murderous king of Egypt, BUSIRIS [bou-seye'ris]. Antaeus. In Libya he wrestled with ANTAEUS [an-tee'us], or ANTAIOS, son of Ge and Poseidon, who could not be beaten so long as he kept contact with the earth, his mother. Heracles held him aloft until he was able to crush him to death. Prometheus. On this journey also it was said that he came to the Caucasus and there released PROMETHEUS [proh-mee'the-us]. See Centaurs above, and MLS, Chapter 4. Theseus, Pirithoüs, and Meleager. In Hades Heracles saw THESEUS [thee'se-us] and PIRITHOÜS [peye-rith'oh-us], or PIRITHOÖS, chained fast to stone seats and released Theseus. He saw the ghost of MELEAGER [me-le-ay'jer] (see MLS, Chapter 22), whose sister, DEÏANIRA [dee-ya-neye'ra], or DEÏANEIRA, he offered to marry. The Robbers Cycnus and Syleus. Helped by Athena and Iolaüs, Heracles killed the Thessalian robber CYCNUS [sik'nus] or KYKNOS, son of Ares, and near the Strait of Euboea he killed another robber, SYLEUS [sil'e-us]. The Cercopes. A pair of mischievous dwarfs, the CERCOPES [ser-koh'peez], or KERKOPES, tried to steal the weapons of Heracles, who caught them and slung them upside down from a pole across his shoulders. They laughed so much at the sight of his buttocks, burned black by the sun, that he let them go. Later they were turned by Zeus into apes (or stones). The Argonautic Expedition and Hylas. Heracles was one of the Argonauts who sailed with Jason (see MLS, Chapter 24), but at Cios he left the ship to search for his companion HYLAS [heye'las], who had been abducted by the water-nymphs. The Argo sailed on without him, and he instituted a cult of Hylas at Cios. Expedition against Pylos. Besides the expeditions against Augeas and Laomedon, Heracles led an army against NELEUS [neel'e-us], king of Pylos, whom he killed along with eleven of his twelve sons. He left as king the survivor, NESTOR [nes'tor], who was a prominent Greek hero in the Trojan War (see MLS, Chapter 19). In the battle at Pylos, Heracles is said to have wounded the gods Hades and Hera, and Apollo and Poseidon are said to have driven him back from the city. He attacked Hippocoön, king of Sparta, who had helped Neleus. Auge and Telephus. During his journey back to Tiryns, Heracles lay with AUGE [aw'jee] at Tegea. Their son, TELEPHUS [tel'e-fus], or TELEPHOS, was put in a chest by Auge’s father and floated over the Aegean to Asia Minor. There Telephus became king and ancestor of the Mysians (see MLS, Chapter 19). In Hades during his last labor, Heracles had promised Meleager that he would marry his sister, DEÏANIRA [dee-ya-neye'ra], or DEÏANEIRA (sometimes spelled in English Dejanira). To win her he wrestled with the river-god ACHELOÜS [ak-e-loh'us], or ACHELOÜS, who also wished to marry her. As a river-god, Acheloüs could turn himself into different creatures. 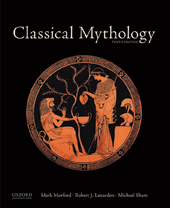 He had bull’s horns on his head, one of which was broken off in the fight and became (or was exchanged with) the miraculous cornucopia (in Latin, cornu copiae, “horn of plenty”), said also to have been the horn of Amalthea, the goat who suckled the infant Zeus on Crete (see MLS, Chapter 3). Nessus. On the way back to Tiryns with Deïanira, Heracles came to the river Evenus, which was in spate. The centaur NESSUS [nes'sus], or NESSOS, carried Deïanira over and, before Heracles could cross, attempted to violate her. Heracles shot him with his bow, and as Nessus lay dying, he told Deïanira to collect some of his blood and keep it, for, he said, it would prevent Heracles from loving any other woman more than Deïanira. She collected the blood and kept it out of the sunlight. She did not know that the arrow that killed Nessus had been dipped in the poison of the Hydra. Iole. Deïanira bore Heracles a son, HYLLUS [heyel'lus], or HYLLOS, and a daughter, MACARIA [ma-kar'i-a] or MAKARIA. Later the hero fell in love with IOLE [eye'o-lee], daughter of EURYTUS [your'i-tus], or EYRYTOS, king of Oechalia (a city on the island of Euboea), who had taught Heracles archery. Eurytus would not give Iole to Heracles, even though he won an archery contest to decide who should have her as wife or concubine. Later the brother of Iole, IPHITUS [if'i-tus], or IPHITOS, came to Tiryns, and there Heracles threw him from the acropolis and killed him. Heracles and Apollo. Heracles asked the Delphic oracle how he might be cured of his fits of murderous madness. When the Pythia refused to answer him, he began to carry off the tripod, so as to set up his own oracle. Apollo prevented him, and their fight was ended by Zeus. Finally the Pythia told him that he must serve as a slave for one year. Omphale. Heracles was sold to OMPHALE [om'fa-lee], queen of Lydia, and served as her slave, even dressing as a woman and spinning wool for her. Heracles and Deïanira in Trachis. Because of the murder of Iphitus, Heracles no longer could live at Tiryns, and he and Deïanira were received by Ceyx, king of TRACHIS [tray'kis]. On the way back to Trachis from Lydia, Heracles attacked Oechalia: he sacked the city, killed Eurytus, and took Iole prisoner, sending her back to Deïanira with his herald, LICHAS [leye'kas]. Deïanira learned from Lichas that Heracles loved Iole. Remembering the advice of Nessus, she smeared a shirt with the centaur’s blood and sent Lichas to give it to Heracles to wear at the sacrifice to Zeus, which Heracles was performing in thanksgiving for his victory. The flames of the sacrificial fire warmed the blood and the shirt clung to the flesh of Heracles, burning him with intolerable pain. In agony he hurled Lichas into the sea and had himself carried back to Mt. Oeta in Trachis. When Deïanira heard what had happened, she killed herself. Hyllus went with his father to Mt. Oeta, where Heracles ordered him to marry Iole. Then Heracles was placed on a huge funeral pyre. The Apotheosis of Heracles. Heracles gave his bow to POEAS [pee'as], or POIAS, father of PHILOCTETES [fi-lok-tee'teez] or PHILOKTETES (see MLS, Chapter 19), as a reward for lighting the pyre. The mortal part of Heracles perished in the flames, while his immortal part ascended to Olympus in a chariot sent by Zeus. There Heracles became one of the immortal gods; he was reconciled with Hera and was given Hebe as his wife. Alcmena and the children of Heracles were persecuted by Eurystheus despite the protection of King Ceyx. They fled from Trachis to Athens and were received by King Demophon, son of Theseus. The Athenians killed Eurystheus with his five sons in battle. Alcmena revenged herself by mutilating the king’s severed head. Euripides said that the Athenian victory was assured by the voluntary sacrifice of Macaria (daughter of Heracles) to Persephone, and that the nephew of Heracles, Ioläus, was miraculously rejuvenated and captured Eurystheus, who was later executed. Pindar says that Ioläus himself killed Eurystheus, whose body was buried in the tomb of Amphitryon at Thebes. Alcmena died at Thebes and went to the Elysian Fields, where she became the consort of Rhadamanthys. In another version she married Rhadamanthys in Thebes (after the death of Amphitryon). After her death Hermes substituted a large stone for her body in the coffin, and her grandchildren set up a shrine to her with a cult. Hyllus married Iole and led an expedition in an attempt to return to the Peloponnese. He was killed by Echemus, king of Tegea. After one hundred years his descendant Temenus invaded the Peloponnese and defeated its defenders, who were led by Tisamenus, son of Orestes. Thus the HERACLIDAE [her-a-kleye'dee], or HERAKLIDAI, “descendants of Heracles” returned to the Peloponnese, where the three principal areas were divided among them: Procles and Eurysthenes ruled Sparta; Temenus ruled Argos, and Cresphontes held Messene. These were the principal Dorian kingdoms in the Peloponnese, and Sparta, which subjugated Messene, and Argos flourished for centuries.